"…While having romance author-worthy amenities like a swimming pool bordering the sand and a bathtub positioned for gazing out to the ocean, the house also has unique flavors that give a little kick, such as a painting hanging on the wall by Dr. Seuss and a bouquet of colorful flowers wrapped in crisp green asparagus spears sitting on the counter...The calm solitude actually buzzes with life...she gives embracing hugs goodbye...."
We rolled on the floor laughing about the painting hanging by Dr. Seuss. We could not figure out the bouquet wrapped in asparagus spears--what was the author really intending to say?! I'm curious to know if this author won a writing prize, who else entered the contest? Embracing hugs, eh? Are there any other kind? Also, who knew Dr. Seuss was in good enough condition to be hanging on the wall? And, about those asparagus spears... usually when romance writers are talking about spears, it's another kind entirely. What's more, it's deflowering they're concerned with -- not so much the bouquet kind. So, at least on that score, our bodices are heaving in relief. 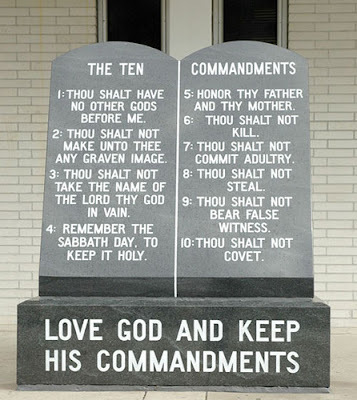 A six-ton granite monument to the 10 Commandments appeared mysteriously at the courthouse in Dixie County, Florida, as if deposited there by a divine being who thinks nothing of carving and lifting such massive pieces of stone. Unfortunately, the creator misspelled "adultery" and totally botched the syntax of No. 4 -- unless he's fresh off a writing workshop with James "A Million Little Pieces (of Fiction)" Frey and decided to take a little liberty with normal sentence structure. But we'll cut God some slack. He's obviously really good at biology and geography. Maybe the spelling and grammar is all Satan's territory. Knowing us, we wouldn't be at all surprised. At our favorite taco stand, a handwritten sign encourages patrons to recycle their "cans." At one of our favorite relative's homes, a sign that said, "Thank you for 'not smoking' " sat sternly on the coffee table for many years. Why is it that the people and places we love tend to abuse quotation marks? People, it's not that hard. They're used for direct quotes and, very often, for titles of books, poetry, movies and songs. They should not be used to be cute. They should not be used to be funny. Nor should they be used for emphasis, whether in print, or in their air-quote form in conversations. We are therefore delighted to introduce you to flickr's "Quotation Mark" Abuse collection. It's a photographic hall of quotation mark shame.